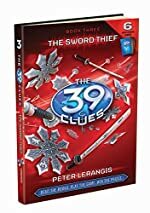 Review: The Sword Thief is the third book in the sublime series, The 39 Clues. It was written by Peter Lerangis. Amy and Dan Cahill are the two main characters and it is the siblings’ job to find all 39 clues in a race. In this resplendent book they have to track the life of fearsome Japanese warrior, Toyotomi Hideyoshi, and to see if he was related in any way with the Cahill family and to solve if he had a clue in his possession. But there is one problem. Figuring out these problems may just easily become lethal. The plot thickens as they get closer and closer to finding the clue. The Sword Thief was a super-thrilling read. The plot was exciting, with suspense lingering on every word. The book was filled with plenty of imagery so you actually felt you were right there right then and actually watching all the action take place. The suspense built up as you read on and despite it being a short read everything is thoroughly explained and nothing is confusing or difficult to understand. I have never read any other book that such well developed characters and a well developed plot. I would recommend this book to anyone who loves reading books filled with action, suspense, humor and an unpredictable ending. Review written by Asheena, Grade 6. Date of review: June 2009.
Review written by Ashir, Grade 6. Date of review: October 2009.